My time management is sometimes suspect to others, especially to my wife who is a fantastically fast and efficient multitasker. Me, I’m a focused and tenacious plodder and perfectionist. I enjoy my creativity and spirituality. So, I think and mull a lot and, therefore, appear to be wasting time. 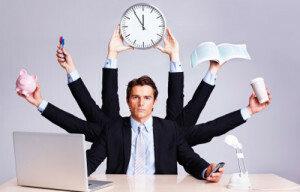 In my opinion, time management techniques to control time is a waste of time. That is unless you first determine what are your highest priorities and values in life. Then, you can more effectively manage what time you have accordingly. What’s the logic for being a fantastic time manager of your daily activities if you’re not managing to enrich your life? My point is that controlling your most important priorities for enriching your life is more important than merely controlling your time with time management techniques. Acting upon your determined most important priorities in life should not be neglected because of what’s incorrectly deemed to be your most urgent activities. Make sure to instill your important long-term priorities with a higher sense of urgency. This means stepping back and taking time to contemplate and figure out specifically what defines an enriched life for you, and how to create it. Moreover, you need to delve into your inner soulful self to identify and continuously monitor for certainty that you’re staying true to your important priorities and core set of values. By doing so, you’ll truly make better use of your time and, in turn, create an enriched life for yourself as well as for the benefit of others. You’ll never be truly happy, free, and fulfilled without first making sure that the foundation underlying your governing priorities and core values is solidly built. Get in touch to let me know your thoughts on this topic. I am always interested in feedback and outside perspective!